Saône-et-Loire is a department in the centre of France. 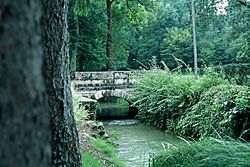 It is in the Bourgogne-Franche-Comté region. It is named after the Saône and the Loire rivers. The largest city in the department is Chalon-sur-Saône. The prefecture (capital) is the smaller city of Mâcon. Saône-et-Loire is one of the original 83 departments created during the French Revolution on 4 March 1790 with Mâcon as its capital. It was formed from combined parts of the old provinces of southern Burgundy and Bresse, uniting lands which have no true geographical unity. It was divided in seven districts: Autun, Bourbon-Lancy, Chalon-sur-Saône, Charolles, Louhans, Mâcon and Semur-en-Brionnais. That same year, the name of the district Semur-en-Brionnais was changed to Marcigny. In 1800, with the creation of the arrondissements in France, the seven districts were changed into five arrondissements: Mâcon, Autun, Chalon-sur-Saône, Charolles and Louhans. On 10 September 1926, the arrondissement of Louhans was eliminated but in 1942 it became again an arrondissement of the department. Saône-et-Loire is part of the Bourgogne-Franche-Comté region. It has an area of 8,574.7 km2 (3,311 sq mi); the seventh largest department of France. Autunois, to the northwest; it is the region around Autun. 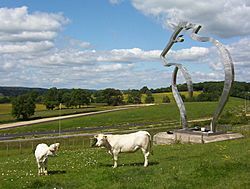 Charolais, to the southwest and around the commune of Charolles. Chalonnais, to the north with Chalon-sur-Saône as the main city. Mâconnais, to the south and around the commune of Mâcon. Bresse, to the east of the Saône river with Louhans as the main city. The main rivers in the department are the Loire, that makes most of the western border of the department and that flows to the north, into the Atlantic Ocean; and the Saône, in the eastern part of the department and that flows to the south and joins the Rhône river at Lyon. The Köppen climate classification type for the climate at Charnay-lès-Mâcon is an "Oceanic climate" (also known as Maritime Temperate climate) and of the subtype "Cfb". 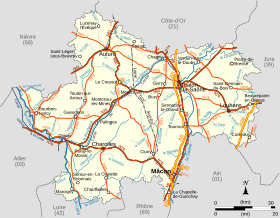 The average temperature for the year in Charnay-lès-Mâcon, to the west of Mâcon and where is the local airport, is 11.7 °C (53.1 °F). The warmest month, on average, is July with an average temperature of 21.1 °C (70.0 °F). The coolest month, on average is January, with an average temperature of 2.8 °C (37.0 °F). The average amount of precipitation for the year in Charnay-lès-Mâcon is 866.1 mm (34.10 in). The month with the most precipitation on average is October with 96.5 mm (3.80 in) of precipitation. The month with the least precipitation on average is August with an average of 50.8 mm (2.00 in). Saône-et-Loire is managed by the General Council of Saône-et-Loire in Mâcon. 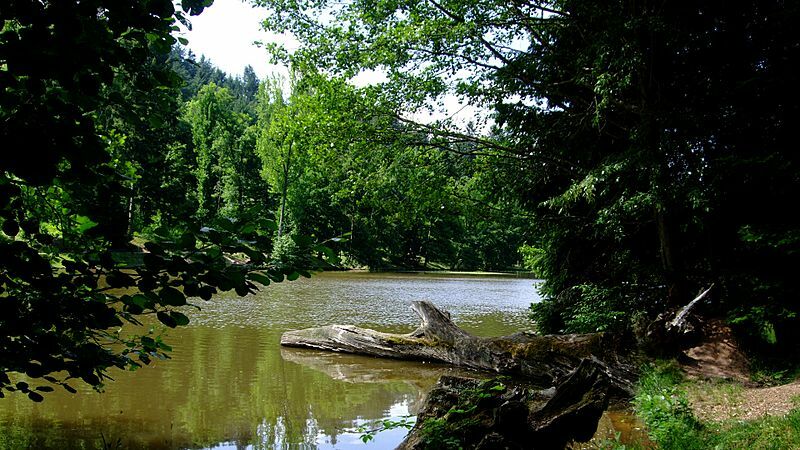 The department is part of the Bourgogne-Franche-Comté region. There are 5 arrondissements (districts), 57 cantons and 573 communes (municipalities) in Saône-et-Loire. 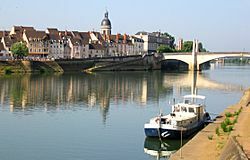 Chalon-sur-Saône and the Saône river. Cows outside of the Maison du Charolais, Charolles. La Bourbonne river near Lugny. The inhabitants of Saône-et-Loire are known, in French, as Saône-et-Loiriens (women: Saône-et-Loiriennes). Saône-et-Loire had a population, in 2011, of 555,999, for a population density of 64.8 inhabitants/km2. The arrondissement of Chalon-sur-Saône, with 198,850 inhabitants, is the arrondissement with more inhabitants. Saône-et-Loire Facts for Kids. Kiddle Encyclopedia.